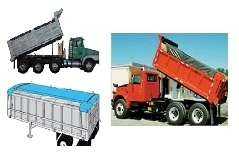 Truck Tarping Systems for Dump Truck & Trailers | Myteeproducts Inc.
Mytee Products carries a reasonable variety of front to back dump truck tarping systems. Our complete systems can be purchased in Steel or Aluminum, motorized or manual. In addition to complete systems, we offer our customers a deep selection of spare parts, many of which fit known market brands such as US Tarp, Roll Rite, Donovan, Tarping Systems Inc, Buyers and many more. The laws in all 50 states require dump truck and open trailer operators to secure their loads prior to departure. This includes everything from stone to grain to waste products. The best way to ensure compliance without breaking the bank is to purchase one of our roll tarps. We specialize in tarps for grain trailers in a variety of sizes suitable for any open-air rig. Our role tarps are made of heavy-duty vinyl along with plenty of webbing straps down the sides. Our tarps are also compatible with most mechanical roll tarp systems. Protect your load and maintain legal compliance with a roll tarp from Mytee Products.